Free up your oven space and reheat these Day Before Mashed Potatoes in your slow cooker! You know how there are some memories that are etched in your brain forever? I can still vividly remember my sixth grade teacher (yes, I know I’m dating myself here) walking into class with tears in her eyes telling us that President Reagan had been shot. And I’m pretty sure we can all remember exactly where we were on 9/11. Another memory that is quite clear for me is the very first Thanksgiving that I hosted. My mom wasn’t there to answer my questions or help me out with cooking. It was just me and Kevin (who was my boyfriend at the time), and we were hosting his whole family, some of whom I was meeting for the very first time. No pressure, right? Kevin’s attitude was, “What’s the big deal? It’s just a turkey!” Hmmm…turkey, stuffing, mashed potatoes, sweet potatoes, cranberries…oh, and meeting people who were not yet my in-laws. Talk about a stressful day! 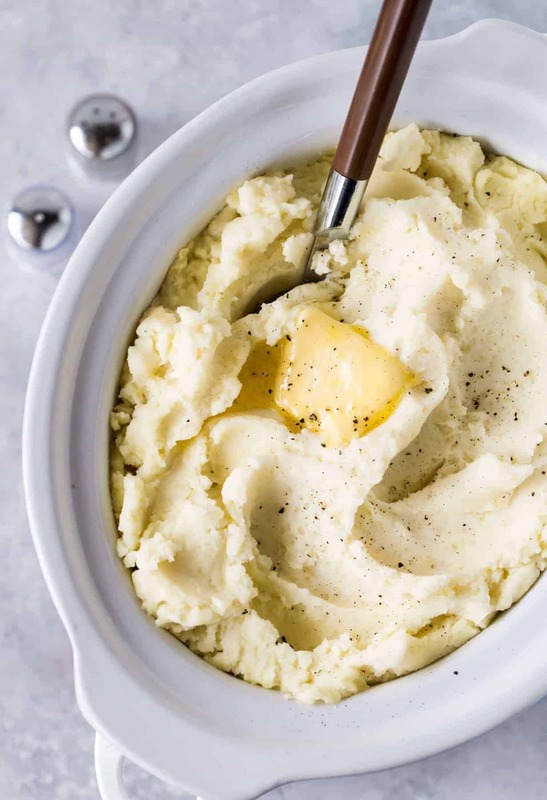 The biggest lifesaver of that Thanksgiving (and many events and holidays since) are these Day Before Mashed Potatoes. That’s right, make the mashed potatoes the day before and reheat them in your crock pot, which leaves your oven open for the rest of the feast’s goodies. You can never have enough oven space on Thanksgiving. 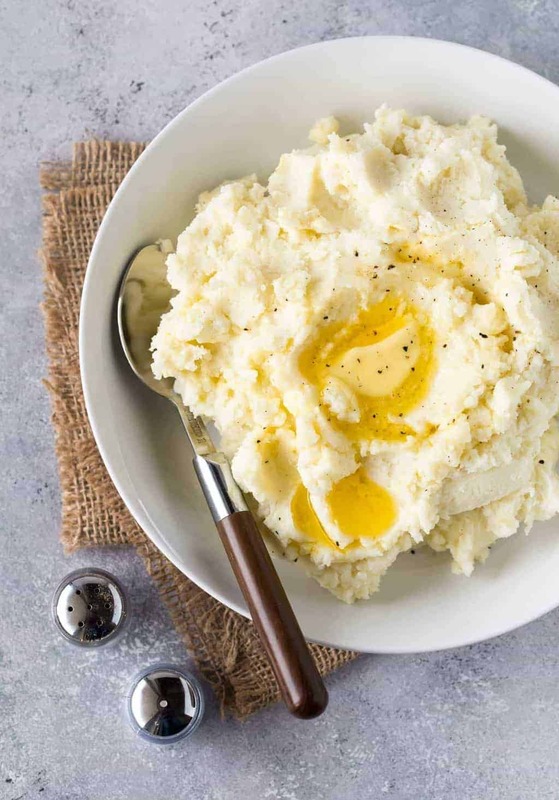 I know I’m a bit biased, but these Day Before Mashed Potatoes are pretty much the best spuds you will ever have. The cream cheese and sour cream make them creamy and rich. In fact, you may not even need gravy. My kids are not gravy lovers (not sure where that came from), but these potatoes are one of the highlights of the meal for them. I loooooove gravy, and these potatoes taste amazing with a big ladle of gravy over the top. But really, my favorite part of these mashed potatoes is that I can have them completely done ahead of time. Pans washed, potatoes mashed and all ready for the big day. If you have ever eaten at my house for any special occasion (or just ever, really), you have had these potatoes. They have bailed me out more than once and forever hold a special place in my heart. It was 17 Thanksgivings ago that I first made them, and Kevin and I have hosted many successful Thanksgivings since. A creamy mashed potato made the day before. Bring a large pot of salted water to a boil. Drop in potatoes and cook until tender but still firm, about 15 minutes. Transfer potatoes to a large bowl and mash until smooth. I use a ricer first and then place them in my stand mixer. Mix in the cream cheese, sour cream, salt, pepper and butter. Be careful to not over mix or they will become gluey. Cover and refrigerate overnight or for at least 8 hours. Place potato mixture in a slow cooker sprayed with cooking spray and cook on low for 5 hours or until heated through, stirring occasionally. These potatoes can also be reheated in the oven. Preheat oven to 350 degrees and lightly grease a medium baking dish. Spread potato mixture into the prepared baking dish, and bake in the preheated oven about 30 minutes or until heated through. I was at that first Thanksgiving and those mashed potatoes were truly amazing…we were so so glad to have Lisa in the family. I have made these potatoes many times with success. Just delicious! OMG! It looks tasty! I am gonna make this as per your instruction. Wish me best of luck! Using Idaho or Russet potatoes will prevent them from turning gluey, in my experience. I also use less sour cream….and they are amazing! Does the cream cheese need to be at room temp or does it blend well with the hot mashed potatoes? I usually pull the cream cheese out when I start peeling the potatoes and it’s perfect! Good luck! Thank you! Making these today! I made them today and I dont think I mashed them good enough as I have tiny little potato pieces in my batch. Is there anything I can do after the fact? Will they go away when I cook them tomorrow. Should I mash until they go away? I just dont want to over mash. Thoughts? The little pieces won’t go away but they will be softer when you bake them again, depending on how bug the pieces are. You could try mashing them a little more, but be careful, if you over mash them, they could get a gluey texture. If they aren’t too big, I say leave them, it lets people know they are real potatoes! Either way, they should still be delicious! Happy Thanksgiving! Ok, so I ran to Bed Bath and Beyond and picked up a potato ricer, and, OH…MY…OMG! That make all the difference in the world for my 2nd batch. 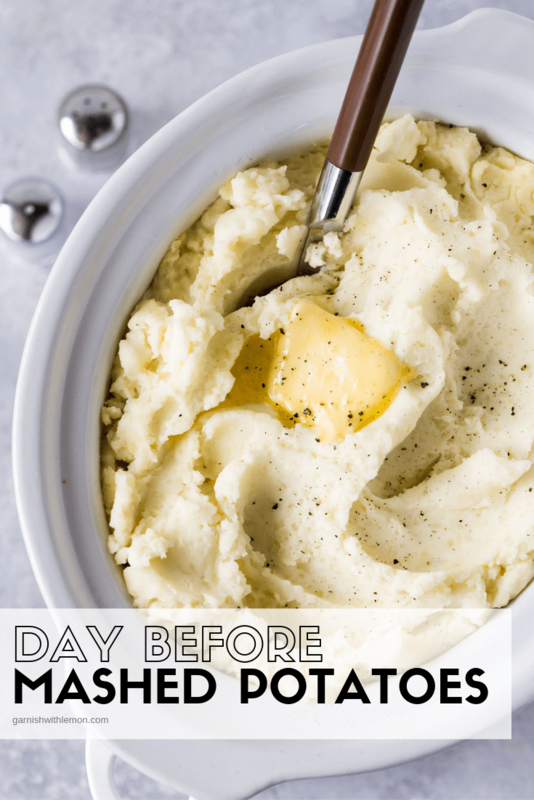 These mashed potatoes are heavenly and now that I have the right tool are super easy! Thank you Lisa for replying to all my questions. Happy Thanksgiving to you! My potato ricer has to be one of my most favorite things! I’m glad it made a difference! Enjoy your Thanksgiving ~ you have put your work in~ your guests don’t know how good they have it! !